In May of 2016, after more than 20 years, the U.S. Food and Drug Administration (FDA) announced the requirements for an updated new food label. The purpose of this change is to reflect new scientific data. This includes the relationship between diet and chronic conditions such as obesity and heart disease, current eating patterns, and–perhaps most importantly–to make it easier for the public to understand nutrition labels and make informed decisions when choosing foods. What is Changing in the Food Label? For food packages that are between one and two serving sizes (e.g. a 20-ounce soda), the serving size will be required to change to one, since people generally eat or drink the whole package. Containers of food with more than one serving size, but that are likely to be eaten in one sitting will require dual column labels: the label on the left reflecting the number of calories in one serving and the label on the right reflecting the amount in the whole container. 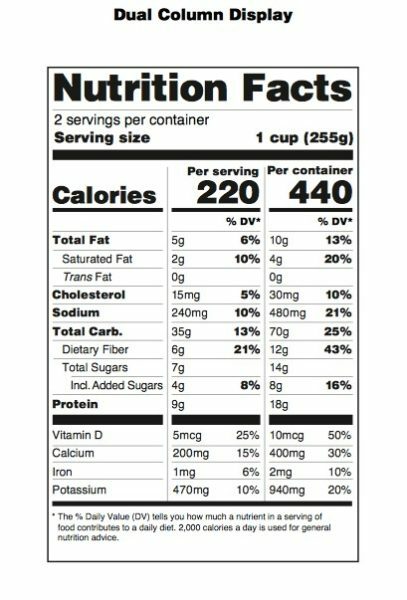 “Calories from Fat” will no longer be included in the new food label, since research shows that the type of fat is more important than the amount. “Total Fat,” “Saturated Fat,” and “Trans Fat” will still be included. What Else Is Being Updated? The 2015-2020 Dietary Guidelines for Americans recommends reducing caloric intake from added sugars to less than 10% of your total daily calories. Having more than 10% makes it hard to meet nutrient needs while staying within calorie limits. To support this recommendation, the new food label will now include the amount of sugar added during the processing of foods, which differs from naturally occurring sugars. These will appear as “Includes Xg Added Sugars” and will be included as grams and percent of Daily Value. When the original food label was developed in the early 1990’s, vitamin A and C deficiencies were common. Nowadays, this is no longer the case in the U.S. So, Vitamin A and C will no longer need to be included on the nutrition label, but can be if the manufacturer chooses to include them. Calcium and iron will continue to be required in the new food label. Interestingly, Vitamin D and potassium were not previously required. But recent Center of Disease Control (CDC) studies have revealed that people generally do not meet the recommended daily amount. Both will now be required in the updated food label. Manufacturers will now need to include the actual amount (e.g. 200 mg) along with the percent Daily Value of vitamin D, calcium, iron, and potassium. The daily values for sodium, dietary fiber, and vitamin D will change to reflect updated research from the Institute of Medicine and the 2015 Dietary Guidelines Advisory Committee Report. These new food label standards will be required for manufacturers with $10 million or more in annual food sales starting January 1, 2020. Manufacturers with less than $10 million in annual food sales will have until January 1, 2021 to comply with these new regulations. Ultimately, the FDA and other health promoting organizations hope that the updated food label will help and encourage people to make better and informed decisions when it comes to food. Visit www.fda.gov for more information and visuals of the new food label! Sofia Gomez-Rubio, RD, LDN is a clinical pediatric dietitian at Nemours/Alfred I. duPont Hospital for Children in Wilmington, Del.